Allover – A fabric with a pattern that is spread evenly over the entire surface of the material. 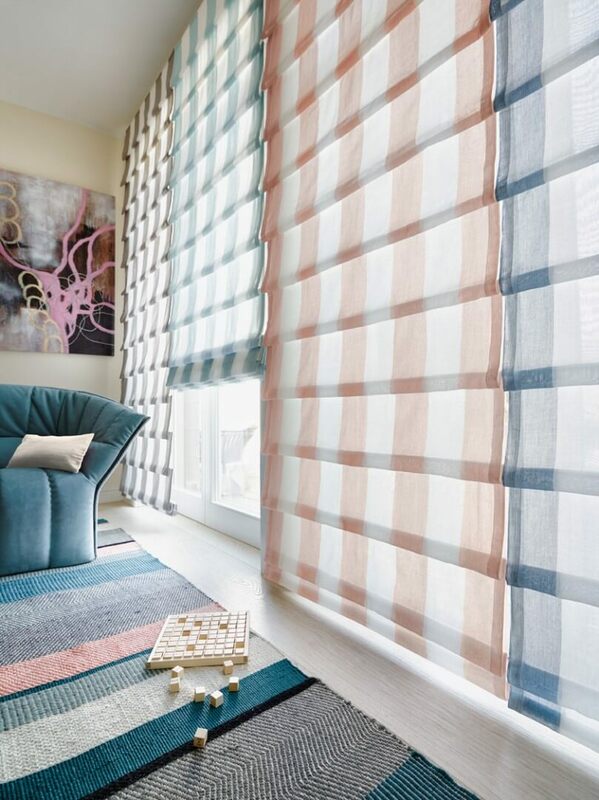 Austrian Shade – Similar to a roman or balloon shade in terms of function, austrian shades feature more detail with sheer fabric falling in a series of puffy festoons created by vertical rows of shirring. When raised, the shade gathers into full poufs; when lowered, it maintains a ruffled, shirred effect. Balloon Shade – A type of roman shade with fullness in the width as well as the length that features one or more scallops that can either reveal when raised or remain, even when lowered. Banding – Strips of fabric that can be made from coordinating or contrasting fabric. The raw edges are turned under, and the fabric band is then attached to the treatment as a decorative accent. Baton Draw – When a drapery is opened or closed by a hand-held baton attached to the master on the rod. Baton Reinforcement – A plastic reinforcement, or stiffener, designed to strengthen the heading of a drapery for baton draw. The plastic is molded in such a way as to fit into the master on the rod. The baton is attached with a screw, through the fabric and reinforcement, into the master. Baton reinforcement is not used with clip-on batons. Board Mount – Referring to a top treatment or a shade being stapled to a dust board. Board Width – The measurement of the actual face width of the board. Bracket-to-Bracket – Measurement from the outside of one bracket to the outside of the opposite bracket. Break – A small amount of fabric that lies on the floor. Cascades – Fabric which is folded and falls in a zigzag fashion down the sides of a top treatment. Cascades are most commonly used with swags, and sometimes referred to as jabots. Center Draw – A pair of draperies which open and close from the center of the window. Also referred to as a split draw or center split. Contrast Lining – Fabric used to line a treatment that is different from the face fabric. This term usually refers to fabric other than standard lining. Coordinates – Two or more decorative fabrics that complement the color and pattern of each other; often purchased as sets. Cordon – ADO Cordon® is a string curtain made using (machine) crocheted yarns where the individual threads hang down loosely. It can be cut to the desired measurements, and feature angled or wavy cuts. These versatile and unique panels can be used in both commercial and residential applications as a window treatment, partition or other design elements. Cornelly Hem – A deep hem with an embroidered pattern where the pieces are joined. Cornice – A flat top treatment with a straight or shaped bottom. Cornice Board – Padded and upholstered wood—top, face and returns. Curtains – Collective term for fabrics for window decoration. 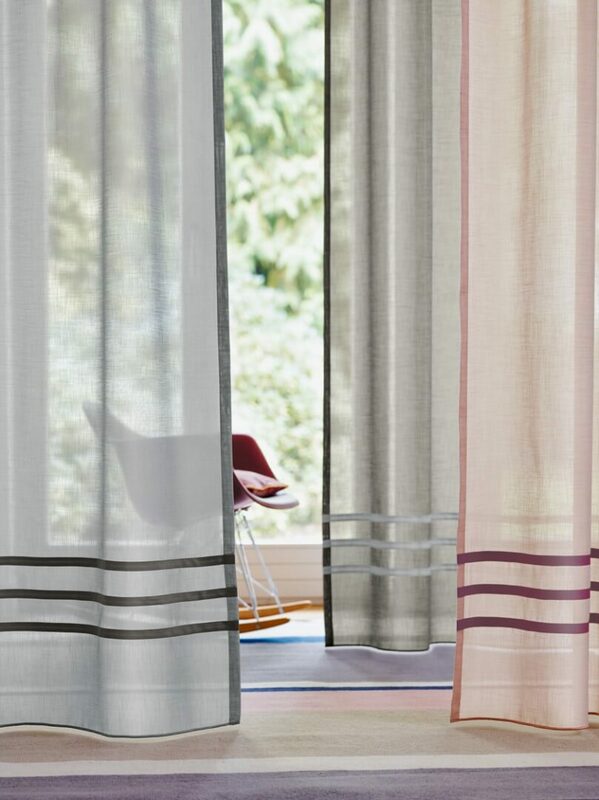 Compared with decorative fabrics, curtains are typically translucent to ensure pleasant light conditions in the room. There are many different production and pattern techniques for curtains, but the majority of curtains are produced with synthetic (polyester) fibers. Curtains are also usually window-length, as opposed to floor-length. Cut Length – The length to which the fabric is cut. The size will include the finished length of the treatment as well as hems, headings, and any necessary allowance for pattern repeat. Cuttings for Approval (CFA) – A small swatch of fabric cut from a specific bolt number or dye lot for color verification. Decorative Fabric – Collective term for all curtain and wall covering fabrics used to design, decorate and adorn rooms. Decorative Rod – A rod designed to show as part of the overall window treatment. It can be wood or metal in various finishes and colors. Drapery – A generic term for window treatments that consists of curtain and/or decorative fabric. This term usually applies to floor-length fabrics, as opposed to window-length. Dust Board – A piece of wood, covered with fabric, and used as a base to hold a top treatment or shade. 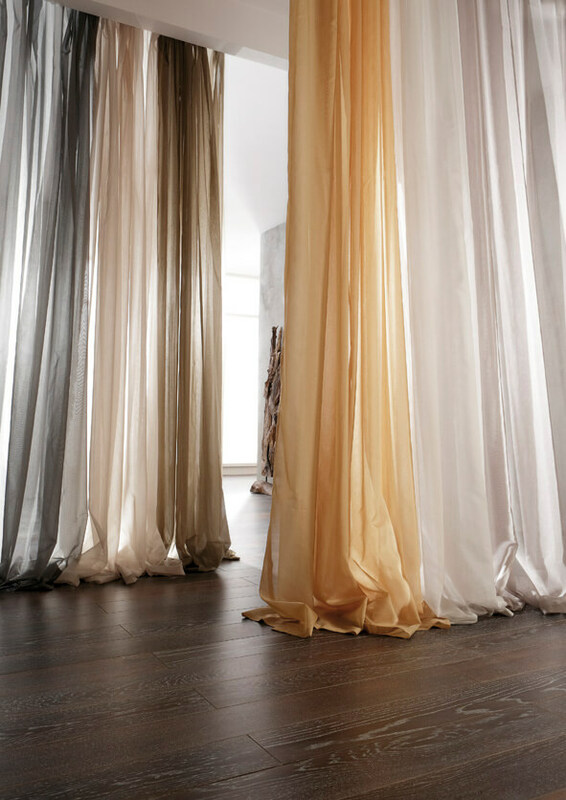 Eurohem – Unique to flair21 and ADO fabrics, this exclusive bottom-sewn, weighted hem provides an ideal drapery hang. Festoon Hem – A deep hem with a decorative chain stitch where the pieces are joined. Finished Length – The total length of the finished treatment. Finished Width – The total width (including face width, returns and overlaps) of a finished treatment. Fullness – Extra fabric (pleated or gathered) on a drapery or top treatment to give volume and dimension. Grommet – An eyelet, usually round, of firm (plastic or metal) material that is attached to fabric in two pieces, with fabric sandwiched in between to strengthen and/or protect the opening. Head, Header or Heading – In general, these terms refer to the various types of tops used for draperies (e.g. pleated, grommet, rod pocket, etc.). More specifically, these terms also refer to the strip of fabric above the pocket of a rod pocket drapery. Headrail – Used to house controls and mount a variety of window treatments. It is comprised of the track and all components necessary for the specific treatment. Home Textiles – Collective term for bedding, towels, table linens, curtains, decorative textiles, furniture fabrics and textile floor coverings. Honeycomb Shades – A type of window treatment with horizontal rows of material, featuring a double-sided cellular structure. These have some insulating value, and lift cords do not show on the front. Horizontal Trim or Band – Trim applied in a side-to-side (horizontal) fashion. Interlining – An insulating, padding or stiffening fabric, sewn between the face fabric and lining. Jabot – Fabric which is folded and falls decoratively between two sections in a top treatment. The term is also sometimes used for fabric that is folded and falls in a zigzag fashion down the sides of a top treatment. 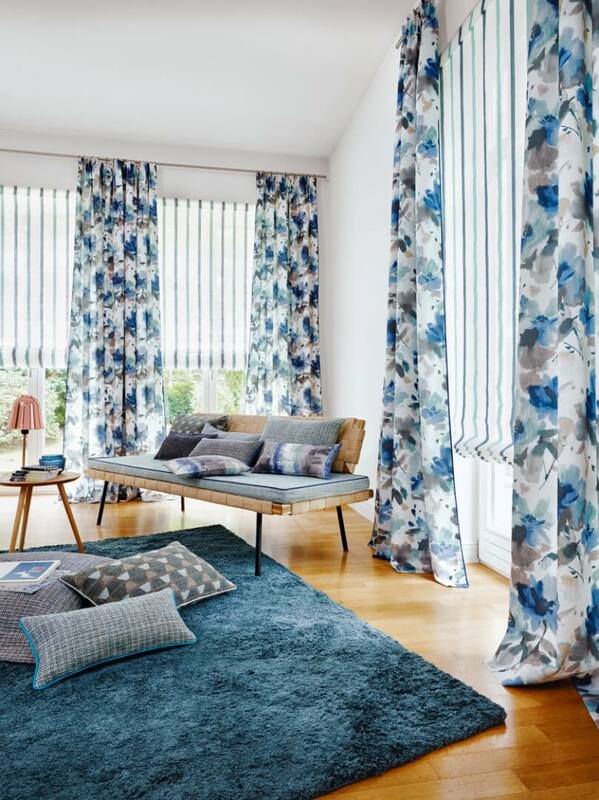 Lining – A generic term for fabrics used to cover the backside of a window treatment; it can be a lining-specific fabric, the same fabric as the face or a coordinating/contrasting fabric. Leading Edge – Side of a curtain or drapery which is drawn to close the treatment. Leading Edge Allowance – An addition to the width of a one-way drapery to allow for the leading edge of the drapery to go beyond the end of the rod when closed. Master – A piece of metal or plastic on the leading edge of the carriers on a drapery rod. The master pushes/pulls the carriers to open/close the drapery. Overdrapery – A generic term for fabrics of a heavier weight (than sheers) and are intended for use as draperies. Overlap – The area in the center of a split-draw treatment where the two halves cross over one another in order to reduce the amount of light showing between the two. Panel – A generic term in window treatments that refers to one complete section of a drapery, curtain or glide. It may represent the entire window covering (if consisting of only one panel) or just a portion (multiple panels to span the entire length of the window or door). Panel Track – A window treatment or room divider that consists of fabric panels attached to a sliding track. The panels are usually 24” – 30” wide and feature a weight bar sewn into the bottom of each panel for added stability. This type of treatment may be manually-operated or motorized. Pelmet – A valance at the upper end of a window decoration. Also used to describe the lower part of upholstered furniture. Pleated Shades – Blinds made from one layer of pleated fabric that create a tight stack when opened. Honeycomb or Cellular Shades are similar to pleated shades, but feature two or more layers joined at the pleats for higher energy efficiency and sound absorbency. Pleats – A technique to create volume by folding the fabric and tacking it to hold the shape. There are many different types of pleats including: Pinch Pleat, Bohemian, Goblet, Inverted, Box, etc. Pin Setting – Space between the top of the drapery pin and the top of drapery panel. Pouf – Fabric gathered and shaped to form a ‘rosette’, which is used to finish (typically) a top treatment. Puddle – A large amount of excess fabric that lies on the floor. Railroaded – Pertains to the orientation in which a fabric is manufactured. When fabric is railroaded, the width of the fabric becomes the length. Most flair21 and ADO fabrics are railroaded, allowing for seamless draperies and other window treatments—of any width—up to 128” tall. Ready-Made – Stock window treatments using plain or decorative fabrics that are cut and stitched according to standard sizing requirements. These mass-produced treatments are typically made using lower-quality fabrics, so they can be sold at a very cheap price. Repeat – The distance between the beginning of one complete pattern and the beginning of the next identical pattern. Fabrics may have a vertical repeat, horizontal repeat or both. Returns – The distance from the front of the rod or board, back to the wall. On a pleated drapery, it is the space from the last pleat to the side of the panel. 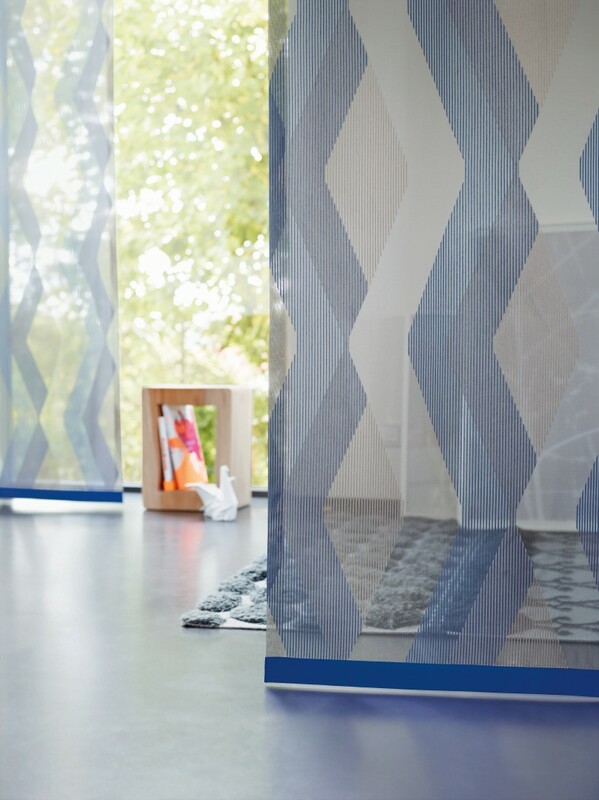 Reversible – Fabrics with different finishes, patterns or textures on both sides, but either one can face out. Ripplefold – Drapery style that attaches to a track using a snap-tape sewn onto the top of each panel. This style creates smooth, evenly spaced folds in the fabric for a clean, modern look. Rod Mount – A top treatment being installed on a rod. Rod Width – The size of the face of the rod (not including any returns or overlap). Can also be called the face width of the rod. Rod Pocket Drapery – Draperies with a pocket sewn into the top (and sometimes the bottom) to allow a rod to slide through for a gathered treatment. Roller Shade (Blinds) – Usually made with stiffened polyester (or another synthetic material), that rolls onto a metal or PVC pole. Roman Shade – Available in many styles (Flat, Relaxed, Hobbled, Front/Back Slat, etc. ), this window treatment is both fashionable and functional. While some styles offer greater functionality (less dressing required), all are available in a wide variety of fabric styles, colors and textures. Sash Rod – A small, utilitarian rod designed to be mounted inside a window frame. Scallops – Typically in reference to top treatments, scallops are a series of convex rounded projections cut in to form an ornamental edge in imitation of the shape of a scallop shell. Self-Lined – Lining a treatment with the same fabric which is being used on the face of the treatment. Sheer – Any transparent or very lightweight fabric (e.g., chiffon, georgette, voile, etc). Also used as a generic term to describe a window treatment made of such material. Shirred – When a fabric is gathered at the top of a treatment or on a rod. Shutters – Hinged panels—often louvered—that are fixed inside or outside a window, and can be closed for security, privacy and/or light control. Sill – A ledge on the bottom of a window opening. Soft Cornice – A flat (sometimes padded) top treatment where the top is attached to a dust board and the bottom hangs loose. Spring Back – When a panel is baton drawn, it is common for the fabric to ‘spring back’ when released. Stack Back – Amount of space taken up by the draperies when in the open position. String curtain – See Cordon. Swag – A top treatment which uses draping fabric folded to form pleats and a scallop shape on the bottom. Tails – Fabric gathered on the ends of certain top treatments, usually with straight sides and bottom. Take Up – The amount of length lost on a rod pocket drapery due to the thickness / dimension of the rod. 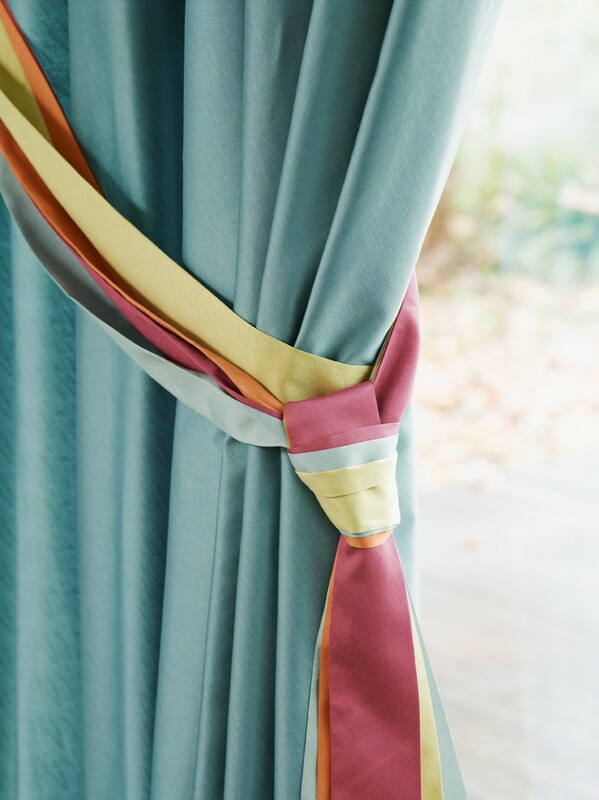 Tiebacks – Designed to hold draperies back from the window in a decorative way. Top Treatment – A decorative feature installed at the top of a window. These can be board mount, rod mount or hung by rings/hooks. Traverse Rod – A drapery rod with a pulley mechanism to easily open and close the panel(s). This type of rod is typically utilitarian in design and hidden with a top treatment, but decorative versions are now more commonly available. Venetian Blinds – A type of window treatment with horizontal slats—usually made of wood, metal or plastic—that can be tilted or raised for privacy and light control. Also know as: Mini Blinds, Persian Blinds or Horizontal Blinds. 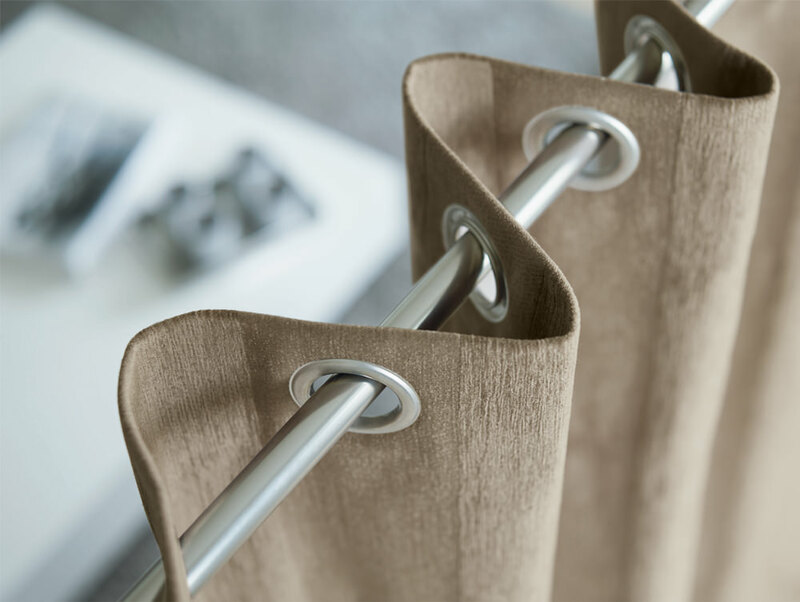 Vertical Wrap – A vertical blind system that features enhanced functionality and aesthetics by wrapping each vane in sheer fabric. This manually-operated treatment may be baton or cord drawn. Also know as the ADOwrap. 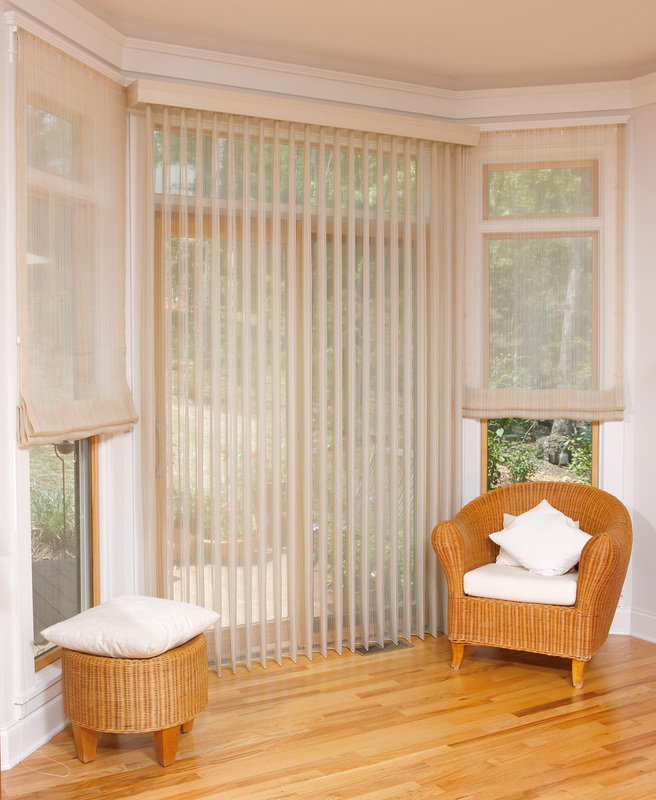 Vertical Blinds – Slats of stiffened fabric, plastic, or metal hanging by one end from a track. 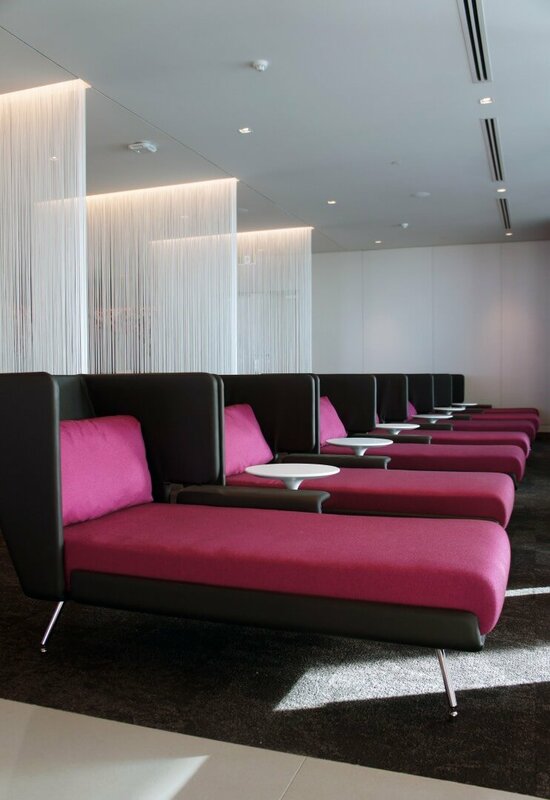 The slats can be rotated or drawn for privacy and light control. Vertical Trim or Band – Indicates that the band or trim will be applied in a vertical or up-and-down fashion. Woven Wood Shades – Typically made from bamboo, grass or other natural materials, these shades are offered in many styles and add organic warmth and texture. Need some advice with your custom window treatments? Fill out the form below and let us know how we can help!